Users of a Moray harbour have hit out at the local authority for its “shocking” condition after a boat became beached on a sandbank. The vessel, Hercules, was being moved from Burghead to Hopeman when it stuck-fast on silty debris due to the low tide. The eight-foot raft was a bigger boat than normal for Hopeman harbour, which is more commonly home to leisure crafts, and it is understood its skipper mistimed the tide. That miscalculation left it stranded in no more than an inch or two of water. They were forced to wait about eight hours before managing to get itself moving. With the harbour having been dredged just once over the last few years by Moray Council’s £2.5 million “white elephant” dredger, the Selkie, and harbour fees increasing by 60% since 2016, some boat users have criticised the local authority and claimed they are “paying for nothing”. Ian McCulloch owns a pleasure boat and keeps it moored in Hopeman and witnessed the Hercules as it ran aground on Wednesday. The vice-chairman of the Hopeman Boat Owner’s Association, he claims that the council need to do more for the users, especially after increasing harbour fees by such a significant amount. He said: “We are now paying a fortune each year, about £400, and nothing ever gets done to keep the harbour in good condition. “This Selkie situation is getting beyond a joke and the harbour is steadily worsening with each passing day. A lack of dredging has resulted in salt and sand building-up at the entrance to the harbour and to the inner harbour as well, causing access problems. The Selkie is a controversial boat. Launched to significant fanfare and amidst claims it would save the council money and generate cash, it has been marooned at Buckie Harbour for about six months due to issues about staffing the vessel. 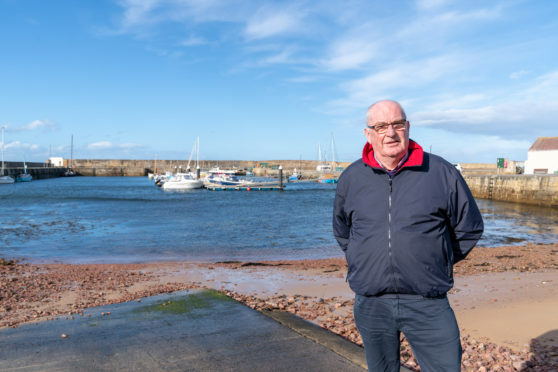 Chairman of the Hopeman Community Association and former Moray councillor Dennis Slater believes action needs to be taken as soon as possible before something serious happens, like a boat being severely damaged. “It seems like the council are all talk and no action and I think heads should be rolling. It is understood there has been minimal movement on efforts to provide the Selkie with a crew. “In 2018, we had work outwith Moray and in August and September weather and tide conditions prevented our planned return to Hopeman.